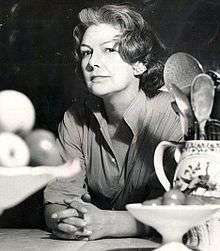 Elizabeth David CBE (born Elizabeth Gwynne; 26 December 1913 – 22 May 1992) was a British cookery writer who, in the mid 20th century, strongly influenced the revitalisation of the art of home cookery with articles and books about European cuisines and traditional British dishes. Born to an upper-class family, David rebelled against social norms of the day. She studied art in Paris, became an actress, and ran off with a married man with whom she sailed in a small boat to Italy, where their boat was confiscated. They were nearly trapped by the German invasion of Greece in 1940 but escaped to Egypt, where they parted. She then worked for the British government, running a library in Cairo. While there she married, but the marriage was not long-lived. After the war, David returned to England and, dismayed by the gloom and bad food, wrote a series of articles about Mediterranean food that caught the public imagination and, in 1950, A Book of Mediterranean Food. She boldly called for ingredients such as aubergines, basil, figs, garlic, olive oil and saffron, which at the time were scarcely available even in London. Within a few years, however, paella, moussaka, ratatouille, hummus and gazpacho became familiar dishes across Britain, both in restaurants and in home cooking. Books on French and Italian cuisine followed, and within ten years David was a major influence on British cooking. She was deeply hostile to second-rate cooking and to bogus substitutes for classic dishes and ingredients. David was born Elizabeth Gwynne, the second of four children, all daughters, of Rupert Sackville Gwynne and the Hon. 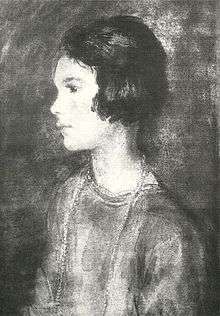 Stella Ridley, daughter of the 1st Viscount Ridley. Both parents' families had considerable fortunes, the Gwynnes from engineering and land speculation and the Ridleys from coal mining. Through the two families, David was of English, Scottish and Welsh or Irish descent and, through an ancestor on her father's side, also Dutch and Sumatran. David and her sisters grew up in Wootton Manor in Sussex, a Jacobean manor house with extensive modern additions by Detmar Blow. Her father, who had a weak heart, nevertheless insisted on pursuing a demanding political career, becoming Conservative MP for Eastbourne, and a junior minister in Andrew Bonar Law's government. Overwork, combined with his vigorous recreational pastimes, chiefly racing, riding and adultery, brought about his death in 1924, aged 51. [n 1] Elizabeth and her sisters, Priscilla, Diana and Felicité, who had little affection from their widowed mother, were sent away to boarding schools. As a teenager David enjoyed painting, and her mother thought her talent worth developing. She was sent to Paris in 1930, enrolling at the Sorbonne for a course in French civilisation which covered history, literature and architecture. She lodged with a Parisian family, whose fanatical devotion to the pleasures of the table she portrayed to comic effect in her French Provincial Cooking (1960). Nevertheless, she acknowledged in retrospect that the experience had been the most valuable part of her time in Paris: "I realized in what way the family had fulfilled their task of instilling French culture into at least one of their British charges. Forgotten were the Sorbonne professors. … What had stuck was the taste for a kind of food quite ideally unlike anything I had known before." Stella Gwynne was not eager for her daughter's early return to England, after qualifying for her Sorbonne diploma, and sent her from Paris to Munich in 1931 to study German. Back in England, David unenthusiastically went through the social rituals for upper-class young women of presentation at court as a débutante and the associated dances. The respectable young Englishmen she met at the latter did not appeal to her. She decided that she was not good enough as a painter and, to her mother's displeasure, chose instead to become an actress. She joined the Oxford Repertory Company in 1933 and moved to the Open Air Theatre in Regent's Park, London, the following year. Among her colleagues in the Regent's Park company was an actor nine years her senior, Charles Gibson-Cowan. His disregard for social conventions appealed strongly to her, and she also found him sexually irresistible. His being married did not daunt either of them. Recognising that she was not going to be a success on the stage, David worked for a while as a junior assistant at the fashion House of Worth, but she found the subservience of retail work irksome. She left in early 1938, and she and Gibson-Cowan bought a boat, just big enough to suffice, with the intention of sailing it to Greece. They crossed the Channel in July 1939 and navigated the boat through the canal system of France. 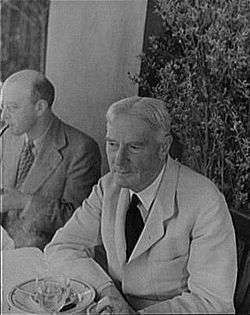 They halted at Marseille and then, for more than six months, at Antibes, where David met and became greatly influenced by the ageing writer Norman Douglas, about whom she later wrote extensively. [n 2] He inspired her love of the Mediterranean, encouraged her interest in good food, and taught her to "search out the best, insist on it, and reject all that was bogus and second-rate." David and Gibson-Cowan finally left Antibes in May 1940, sailing to Corsica and then to Sicily, where they were suspected of spying and were interned. After 19 days in custody in various parts of Italy, they were allowed to cross into Yugoslavia. They had lost almost everything they possessed—the boat, money, manuscripts, and notebooks and David's cherished collection of recipes. With the help of the British Consul in Zagreb, they got to Athens in July 1940. By this time, David was no longer in love with her partner but remained with him from necessity. Gibson-Cowan got a job teaching English on the island of Syros, where David learnt to cook with the fresh ingredients available locally. When the Germans invaded Greece in April 1941, the couple managed to leave on a civilian convoy to Egypt. Suleiman performed minor miracles with two Primus stoves and an oven which was little more than a tin box perched on top of them. His soufflés were never less than successful. … For three or four years I lived mainly on rather rough but highly flavoured colourful shining vegetable dishes, lentil or fresh tomato soups, delicious spiced pilaffs, lamb kebabs grilled over charcoal, salads with cool mint-flavoured yoghurt dressings, the Egyptian fellahin dish of black beans with olive oil and lemon and hard-boiled eggs—these things were not only attractive but also cheap. In her years in Cairo, David had a number of affairs. She enjoyed them for what they were, but, with one exception, she did not fall in love. [n 3] Several of her young men, however, fell in love with her; one of them was Lieutenant-Colonel Tony David. By now in her thirties, David weighed the advantages and disadvantages of remaining a spinster until such time as the ideal husband might appear, and with considerable misgivings she finally accepted Tony David's proposal of marriage. Elizabeth Gwynne married Tony David in Cairo on 30 August 1944. Within a year, her husband was posted to India. She followed him there in January 1946, but she found life as the wife of an officer of the British Raj tedious, the social life dull, and the food generally "frustrating". In June 1946, she suffered severe sinusitis and was told by her doctors that the condition would persist if she remained in the summer heat of Delhi. Instead, she was advised to go back to England. She did so; her biographer Artemis Cooper observes, "She had been away from England for six years, and in that time she, and England, had changed beyond recognition." With the earnings from articles commissioned by magazine editors in the wake of the success of the first book, and the advance on the second book, David was able to tour France before completing the manuscript. This was her last holiday with her husband and it was not wholly successful. Once French Country Cooking was finished, David decided to live in France for a time, leaving her husband in London. She spent a cold spring and a warm summer in Provence, from which her fourth book, Summer Cooking, was partly drawn. Work on that book was postponed, as David had agreed with Lehmann that her next work should be about Italian food. Italian Food, with illustrations by Renato Guttuso, was published in 1954. At the time, many of the ingredients used in the recipes were practically unavailable in Britain. Looking back in 1963, David wrote, "In Soho but almost nowhere else, such things as Italian pasta, and Parmesan cheese, olive oil, salame, and occasionally Parma ham were to be had. With southern vegetables such as aubergines, red and green peppers, fennel, the tiny marrows called by the French courgettes and in Italy zucchini, much the same situation prevailed." David was less en rapport with Italy than with Greece and southern France and found preparing and writing her Italian Food (1954) "uncommonly troublesome". The effort she put into the book was recognised by reviewers. The Times Literary Supplement wrote, "More than a collection of recipes, this book is in effect a readable and discerning dissertation on Italian food and regional dishes, and their preparation in the English kitchen." The Observer remarked, "Mrs. David … may be counted among the benefactors of humanity." In The Sunday Times, Evelyn Waugh named Italian Food as one of the two books that had given him the most pleasure in that year. In 1960, David stopped writing for The Sunday Times, where she was unhappy about editorial interference with her copy, and joined the weekly publication The Spectator. Cooper writes, "Her professional career was at its height. She was hailed not only as Britain's foremost writer on food and cookery, but as the woman who had transformed the eating habits of middle-class England." Her books were now reaching a wide public, having been reprinted in paperback by the mass-market Penguin Books. Her private life was less felicitous. She was greatly distressed at the ending of her affair with Higgins, who fell in love with a younger woman, and for a period she drank too much brandy and resorted too often to sleeping pills. Probably as a result of these factors and overwork, in 1963, when she was 49, David suffered a cerebral haemorrhage. She recovered, but her sense of taste was temporarily affected, and her confidence was badly shaken. David continued to write articles for magazines. She still included many recipes but increasingly wrote about places—markets, auberges, farms—and people, including profiles of famous chefs and gourmets such as Marcel Boulestin and Edouard de Pomiane. In her later articles, she expressed strongly held views on a wide range of subjects; she abominated the word "crispy", demanding to know what it conveyed that "crisp" did not;[n 7] she confessed to an inability to refill anybody's wineglass until it was empty; she insisted on the traditional form "Welsh rabbit" rather than the modern invention "Welsh rarebit"; she poured scorn on the Guide Michelin's standards; she deplored "fussy garnish... distract[ing] from the main flavours"; she inveighed against the ersatz: "anyone depraved enough to invent a dish consisting of a wedge of steam-heated bread spread with tomato paste and a piece of synthetic Cheddar can call it a pizza." In the 1980s, David made several visits to California, which she much enjoyed, but her health began to fail. She suffered a succession of falls which resulted in several spells in hospital. The death in 1986 of her younger sister Felicité, who had lived in the top floor of her house for thirty years, was a severe blow to David. In May 1992 she suffered a stroke followed two days later by another, which was fatal. She died at her Chelsea home on 22 May 1992, aged 78, and was buried on 28 May at the family church of St Peter's, Folkington. David won the Glenfiddich Writer of the Year award for English Bread and Yeast Cookery. She was also awarded honorary doctorates by the Universities of Essex and Bristol, and the award of a Chevalier de l'Ordre du Mérite Agricole. However, the honour that most pleased her was being made a Fellow of the Royal Society of Literature in 1982 in recognition of her skills as a writer. In 1976 she was awarded an OBE. In 1986 she was awarded a CBE. David has appeared in fictional form at least twice. In 2000 a novel, Lunch with Elizabeth David by Roger Williams, was published by Carroll & Graf, and in 2006 the BBC broadcast Elizabeth David: A Life in Recipes, a film starring Catherine McCormack as Elizabeth David and Greg Wise as Peter Higgins. David's papers are at the Schlesinger Library at the Radcliffe Institute for Advanced Study, Harvard University. ↑ Cooper, p. 21, states that Rupert Gwynne was 52 at the time of his death, but Who's Who and Alumni Cantabrigienses confirm Gwynne's date of birth as 2 August 1873, making him 51 when he died. ↑ Two of her essays about him, "Have It Your Way" and "If You Care to Eat Shark", are included in An Omelette and a Glass of Wine (1984). ↑ The exception was a young officer, Peter Laing, who returned to Canada and married there. ↑ David's views on inappropriate illustrations were expressed in her essay "South Wind in the Kitchen". ↑ Respectively, a Provençal dish of fillets of white fish in an aïoli and cream sauce, and a Languedoc casserole of beans with pork, mutton, sausage and goose. ↑ David maintained that the crushing action of garlic presses caused only the juice of the garlic to be extracted, which then tasted acrid. She recommended crushing a peeled garlic clove with the flat blade of a heavy knife and adding a little salt. ↑ Later cooks including Nigella Lawson and Simon Hopkinson remained aware of David's disapproval of the word. ↑ Koski, John (13 November 2010). "Elizabeth David: The woman who changed the way we eat". Daily Mail. Retrieved 11 July 2015. ↑ Chaney, pp. 5–6; Cooper, p. 2; and Cullen, p. 623, where the Gwynnes' purported Welsh ancestry is stated to be Irish. Her uncle, Roland Gwynne, Mayor of Eastbourne (1928–1931) and suspected lover of John Bodkin Adams, went so far as to submit "a false entry to Burke's Peerage" claiming the family was Welsh (Cullen, p. 623). ↑ "Gwynne, Rupert Sackville (GWN891RS)". A Cambridge Alumni Database. University of Cambridge. ↑ "David, Elizabeth (1913-1992)". English Heritage. Retrieved 26 May 2016. Wikimedia Commons has media related to Elizabeth David.